Custerâ€™s Adjutant, Lt. William W. Cooke, hurriedly penciled the Generalâ€™s order into a small notebook.Â Ripping the page out, Cooke handed it to Custer who called out for an orderly to deliver it.Â A trooper, mounted on a white horse with a trumpet slung across his back, quickly trotted up and took the note.Â Before he departed, Custer instructed, â€œTrumpeter, go back on our trail and see if you can discover Benteen and give him this message. If you see no danger come back to us, but if you find Indians in your way stay with Benteen and return with him and when you get back to us report.”Â Tucking the note into his gauntlet, the bugler spurred his horse back up the trail.Â Looking back quickly, he watched as the Seventh Cavalry troopers descended the ravine to the Little Big Horn River and history.Â It would be the last time the bugler would see Lt. Colonel George A. Custer and his 210 cavalrymen alive. The bugler, though, had more urgent concerns.Â Dodging rounds fired from Indians perched on nearby bluffs, he rode hard and fast over the irregular terrain.Â A short time later, with his horse wounded, he finally located Captain Frederick Benteenâ€™s command and delivered the dispatch.Â A sheet of paper saved the buglerâ€™s life that day.Â By carrying Custerâ€™s last message, the bugler – John Martin – remains almost universally acknowledged as the â€œlast white man to see Custer alive.â€ Â Penned by Cooke, Custerâ€™s order remains arguably the most famous in American military history. Today, the nearly complete annihilation of Custer’s last command at the hands of Lakota, Cheyenne and Arapaho warriors provides a continuing source of study and debate for historians and scholars alike; it remains etched in our collective history, examined as much for its myths as for the many mysteries.Â The exhaustive research extends to not only strategic and tactical concerns, but also to the many complex personalities involved with voluminous studies based on the lives of Sitting Bull, Crazy Horse and George Armstrong Custer.Â Much less is known about Bugler John Martin, one of the more fascinating yet enigmatic figures from Custerâ€™s Last Stand on June 25, 1876.Â Who was the man that fate chose to save that day and why does his place in history stretch far beyond the events at the Little Big Horn? 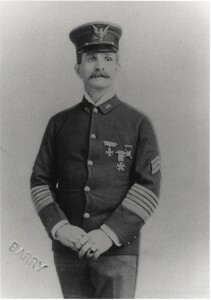 The one certainty in any analysis of the bugler, John Martin, is that he was born in Italy.Â At this point, however, the ambiguities begin.Â Upon his arrival in the United States in 1873, as often occurred with immigrants in their effort to â€˜fit inâ€™, he anglicized his name to John Martin.Â Most scholars and historians assume that his birth name was Giovanni Martini, a seemingly logical conclusion occasionally reinforced by Martin himself.Â Yet, more recent research conducted in Italy reveals that John Martin was actually named Giovan Crisostimo Martino prior to his arrival in America. In an effort to determine his true identity, the first logical step would be to establish his actual place of birth.Â Two distinctly diverse Italian towns concurrently claim him as their native son.Â Apricale is a tiny picturesque hilltop comune (municipal town or village) located in the far western Italian region of Liguria. Â Typical of many Italian villages, Apricale is a labyrinth of mostly cobbled roads surrounding the 11th century Castello della Lucertola.Â Almost 1,000 kilometers away, down the Italian peninsula, lies Sala Consilina, a rugged little town perched on a Campania hillside.Â It remains the largest town in the Vallo di Diano in southwestern Italy.Â Although earlier research hinted that Apricale might be Martinâ€™s place of birth, and despite that town still claiming him as one of their own, there exists sufficient evidence to refute effectively this conclusion.Â Perhaps part of this confusion stems from a certain Giovanni Battista Martini, who was born in Apricale in 1847; there are others – with the same or similar names – that later fought with Giuseppe Garibaldi during the middle period of the Italian fight for unification.Â Another aspect for consideration is the poor quality of some parish records, often lost or damaged by flood or fire, rendering them unreadable.Â U.S. Army enlistment records, completed by Martin prior to his induction, list Sala as his place of birth. Martin usually claimed he was born on January 28, 1853 in Sala Consilina.Â Although most biographers accept Sala Consilina as his birthplace, they may have hesitated due to a lack of primary documents substantiating this fact. Â Another factor likely contributing to their dilemma was Martinâ€™s own inconsistencies regarding his birth.Â In 1906, during an interview with the Brooklyn Standard Union on the eve of the 25th anniversary of the Battle of Little Big Horn, it was reported that Martin was born in Sala Conizalina (sic) in 1847.Â Two years later, in late October 1908, Martin was interviewed extensively by Walter Mason Camp, well-respected editor and historical researcher, regarding his role at the Little Big Horn.Â During their meeting, Camps notes that Martin states he was born in Italy in January, 1853.Â Martin never clarified the birth date contradictions, almost certainly for the reason that it was not relevant to the interviewer at that time.Â Martinâ€™s own less than perfect recollection begs the question: Â Was he inscrutable by choice or default?Â Speculations abound as to his reasons.Â One possible explanation may be that, since Martin was an orphan, issues such as birth place, date, and even surname, carried less importance to him.Â While never forgetting his Italian origins, he may have placed more significance to his current identity as John Martin, American citizen and soldier. In 1997, two researchers from Sala Consilina – Professor Giuseppe Colitti and Dr. Michele Esposito – conducted an extensive search for information on Martinâ€™s birth.Â Their examination of birth and parish records in both Rome and Sala Consilina failed to produce any males born between 1851 and 1853 with the last name of Martini.Â Later that year, however, their luck changed when a special register was located in Sala Consilina.Â This newly discovered register was reserved for children who had been abandoned or neglected.Â During my research for Italian birth records, I often found references to a â€œruoto dei projetti,â€ literally translated to â€œwheel of the project.â€Â Professor Colitti relates that these children were essentially placed or sat on a spoke of a wagon wheel in the hope that a family member might recognize or, perhaps, a stranger would adopt them. It was in one of these â€˜mixedâ€™ registers that Colitti and Esposito found a document akin to a birth and baptismal certificate for Martin dated January 28, 1852.Â From the document, they learned that Martinâ€™s actual baptismal name was Giovan Crisostimo Martino.Â The name had been given to him by Salaâ€™s mayor, Fedele Alliegro, during the babyâ€™s baptism at the Church of San Nicola.Â Martin has been found abandoned near the Church of the Annunciation in Sala the previous day, dressed simply in a white cloth and filthy bonnet; he appeared in good condition and was thought to be about a month old.Â His name and parents unknown, and with the need to baptize him quickly (greatly encouraged in the Roman Catholic Church), Alliegro apparently named the boy after Saint Giovan – or Giovanni – Cristostimo whose Feast Day was celebrated the previous day.Â The comune of Sala, under Alliegroâ€™s direction, sent him to a certain Mariantonia di Gregorio, wife of Francesco Botta.Â Although orphaned children were often sent to a home in Naples, on this occasion, little Giovan was an exception for reasons unknown. This information, therefore, would seem to confirm that he was born either in early January, 1852 or possibly late December, 1851.Â The lack of attention to detail regarding the dates seems more reasonable when considering that, in the culture of rural Italians, actual dates of birth mattered little.Â A niece to one of Martinâ€™s great granddaughters, Bessie, confirms that he told the familyÂ his birth date was January 1, 1852, and that he was born in Sala.Â Since his exact date of birth remained essentially unknown to Martin, it allowed him the freedom to provide varying dates in his later years without remorse.Â For Martin, like the small town Italians of his youth, actual dates remained irrelevant facts. Â Professor Colitti is convinced that Martino was born in November of 1851 and his surname of Martino reflects this: Italians traditionally celebrate the Feast or San Martino on November 11. The Italian researchers also concluded that the Italian surname Martini would support the claim of Apricale as his birthplace since the name is indigenous to the Liguria region.Â Consequently, the surname Martino – of Roman origins – would confirm Sala Consilina as Martinâ€™s town of birth.Â Generally, Italian surnames ending in â€˜oâ€™ are more often found in southern Italy, while many surnames ending in â€˜iâ€™ are found in the northern sections.Â Matching oneâ€™s place of birth with their surname may seem unreliable, but in mid-19th century Italy, rural Italians were less likely to move far from their place of birth except for possibly immigrating to another country. Finally, Martino traveled to the United States in 1873 aboard the S.S. Tyrian of the Anchor Line of Glasgow.Â That shipâ€™s manifest for April 1873 lists Giovanni Martino, a 21-year-old laborer from Italy, as a passenger.Â This information was confirmed via The Battery Conservancyâ€™s CastleGarden.org project.Â Furthermore, there is no record of any male passengers with the surname Martini arriving aboard the S.S. Tyrian in the year 1873. This entry was posted on Tuesday, September 28th, 2010 at 1:11 am	and is filed under Bugle Stories, History of Taps, History of the Bugle. You can follow any responses to this entry through the RSS 2.0 feed. Responses are currently closed, but you can trackback from your own site.